Taniyah Thompson of Hamden tries to hang onto the ball as East Haven presses late in the game at Hamden High School on February 5, 2019. 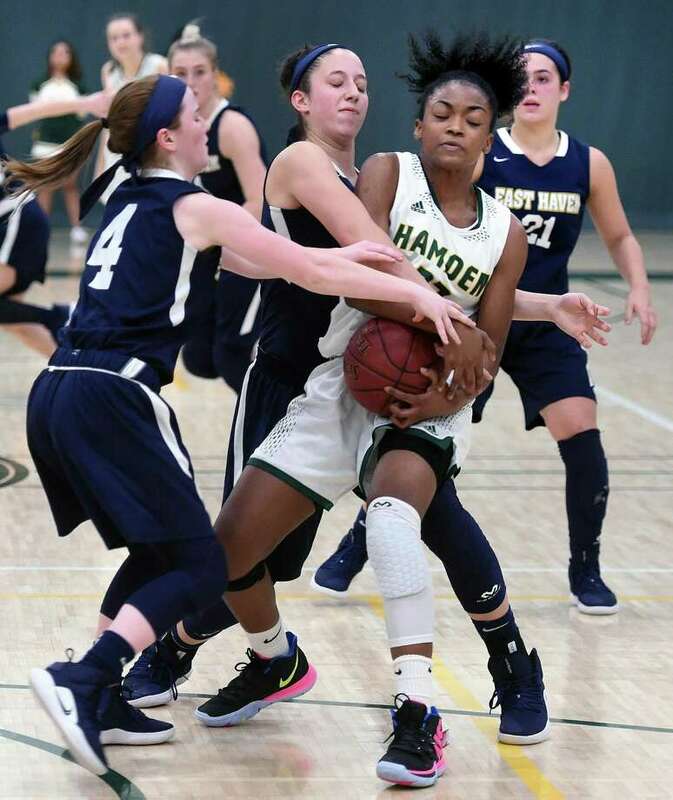 Taniyah Thompson, Hamden: The senior paced the Dragons with 26 points in a 60-56 win over East Haven. Tyree Allen, Hillhouse: The senior point guard finished with 20 points as Hillhouse defeated Sheehan 54-42. Maggie Lee, Pomperaug: The senior made four 3-pointers as part of a 22-point effort in a 73-47 victory over Startford. Naeva Rene, Norwalk: The senior forward scored a game-high 16 points as Norwalk defeated Danbury 55-35, staying unbeaten. Alice Kelly, Wethersfield: In a 76-72 OT win over Bloomfield, junior Alice Kelly led the way with 29 points. Cali Jolley, Law: Jolley scored 22 points leading Law over Bassick 64-62. Fallon Andriolas, Law: In the same game, Andriolas scored 21 points. Emma Elrod, St. Joseph: The senior forward poured in a game-high 20 in a losing effort against Trumbull. Jazmyn Soto-Alston, East Catholic: The sophomore guard scored 20 points as part of a 44-37 win over RHAM. Catie Donadio, Morgan: Donadio led the way with 23 points for Morgan in a 56-42 Shoreline Conference win at North Branford. Jessie Kilburn, North Branford: The senior posted a double-double (23 points, 11 rebounds) for the Thunderbirds in the loss to Morgan. St. Paul at Naugatuck, Fri. 5:30 p.m.: The Greyhounds have won seven of their last eight since losing to St. Paul Jan. 8. St. Paul hoping to claim top spot in the NVL. East Hartford at East Catholic, Fri. 6:45 p.m: The difference between two and four losses is going to matter when it comes time to seed CIAC tournaments. Hand at Wilbur Cross, Fri. 7 p.m: Tigers closing the season against three-straight tournament-bound teams in Mercy, Cross and Hamden. Newtown at Kolbe Cathedral, Fri. 7 p.m: Two of the SWC’s top 3 go at it in a possible playoff preview. Trumbull at Norwalk, Mon. 6:30 p.m: Norwalk’s unbeaten season on the line as is the No. 1 seed in the FCIAC tournament. Stonington at Bacon Academy, Mon. 7 p.m: This game likely for second place overall in the ECC. Mercy at East Haven, Mon. 7 p.m: Mercy has won 10-straight in the SCC since falling to East Haven 54-52 Jan. 4. Housatonic Regional at Northwestern, Tue. 7 p.m: Housatonic handed Northwestern its only loss this season. Top spot in the Berkshire League at stake. Warde at Ludlowe, Wed. 5:15 p.m: The rivalry game could double as a play-in game to qualify for the FCIAC tournament.